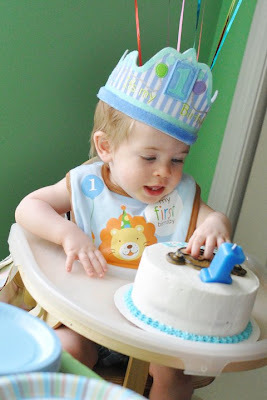 Super Hero Boy: Dylan turns a year old! Dylan turns a year old! I'm still speechless, how on earth has it been a year? 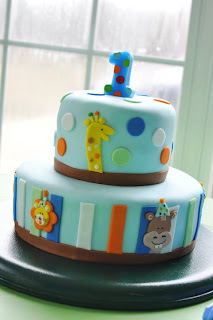 Dylan had his first birthday party over the weekend. It was a small event compared to some of our other parties in the past.. no blow ups, no fancy location, just a good ole fashioned home birthday party with friends and family. I have to admit I did splurge on our cake and I hired a photographer though both were more than reasonable and I really didn't spend more on the cake than I would have regularly. However the party was amazing and I loved having our friends and family all at our new house and even Nana (my grandmother) came up from Florida for the day. Dylan has had quite the first year most of which he spent being sick, going through therapy, and visiting countless doctors trying to figure out exactly what happened in the first place. For those of you that have not kept up with us on Facebook we've had sort of an up and down year. It all started when he was about two months old and he started crying non stop 12 to 14 hours a day.. every day.. for several months. We were told it was acid reflux and colic but nothing helped him and the movements of even a swing would set him off. He never gained a ton of weight and though I'm an avid breast feeding supporter he could never seem to get enough suction to keep my milk supply going and I was forced to put him on formula against everything I felt was important. He just seemed to be getting weaker and weaker and smaller and smaller and finally around five months he got very ill with what at first seemed like a virus which landed him in the hospital for over a week with severe nausea and he couldn't keep any formula or even just plain water down. The poor little guy left the hospital at only barely over his birth weight. I really didn't even realize how fragile he was until I went back recently and looked at some pictures I took of him not long after. His little arms were soo skinny. Afterwards it was all a struggle to get back to normality. He failed to meet any of his milestones, and had to be put in physical therapy and he just couldn't seem to get his strength up and was missing all his milestones. To top it off we could never figure out exactly what happened in the first place. We were sent to neurologists, nutritionists, and even to the children's hospital. His gross motor skills were severely off and his leg muscles were so tight early on that I couldn't even get him into a proper sitting position. Though many scary things were mentioned thus far he has tested negative for everything he's been tested for. I will say however that physical therapy was a godsend and he's improved dramatically since we started working on his muscle tone and flexibility. Now I'm proud to say at a year old it's almost impossible to tell anything was ever wrong he now meets all his milestones and he took his first independent step during his birthday party (though I missed it!!!). He still suffers from slightly stiffer than normal leg muscles but I'm more than positive that if we keep on it and keep him active that as he grows that too will become a distant memory. Dylan is a beautiful baby, always happy, always smiling, just a pure joy. He's taken everything in stride and worked so hard to build those muscles and he refuses to hear the word no. It seems every time we have a setback and any time anyone mentioned that it may take him longer to reach a milestone it always seems like he understands and works three times as hard to show them differently. I mean can you believe that he learned to sit up at Christmas and now just a few short weeks later he is not only standing and cruising but attempting to walk as well! Even just two weeks ago they were sure he would be in leg braces for at least a year if not more and now he's attempting to walk independently. Now I wonder if leg braces are even the best choice for him. He always surprises me! Even in the last two months he has gained SIX pounds and now is not only on the growth chart but is shooting up it at amazing speeds. Dylan, I love you little man. I know it seems like we got cheated a little on your first year... I can't wait to see what you do this year. I love you and I will be at your side and ready and excited for all there is to come! For all our readers I'm grateful for your continued support. Dylan, Connor and I love you guys and we hope that this year will bring us more towards normality and we can't wait to share what is to come with you all. All of the above photos were taken by Jessala White Photography and the amazing cakes were made by Coloring on the Walls. Thanks ladies they were amazing! Happy 1st Birthday to Dylan! He is a strong little man.